Batman: Arkham Knight has more than one playable vigilante. A leaked GameStop ad reveals that players can take on the role of the infamous Red Hood in a DLC pack. Red Hood is the alter-ego of Jason Todd, the second Robin. Todd was kidnapped and apparently killed by the Joker. However, he resurfaces years later as a brutal crime-fighter. Unlike Batman, he's willing to kill criminals to keep Gotham safe. The game's campaign already has a twisted version of Batman called the Arkham Knight. This armored figure, who wears an Arkham logo on his chest, has some unknown score to settle with Batman. Many Batman fans thought that Jason Todd would be the real identity of the Arkham Knight. If Red Hood does exist in the Arkham universe, though, it seems unlikely that Todd would be using that alias and acting as the Arkham Knight though. Seems a little redundant on his part. Red Hood's appearance in the DLC doesn't necessarily mean he's part of Arkham Knight's campaign. Keep in mind that Nightwing and Robin were both playable in Arkham Knight's add-ons but only played minor roles in the wider story. The Red Hood DLC could just be a standalone experience intended for long-time fans of the Dark Knight. 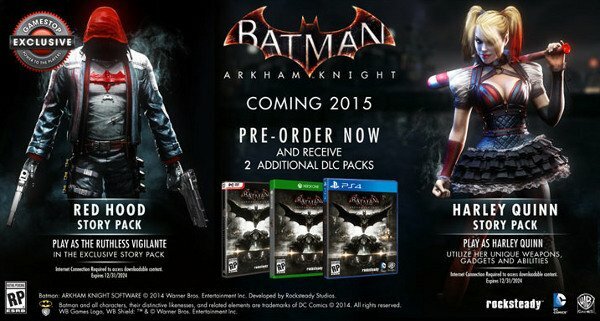 The GameStop ad reveals the Batman: Arkham Knight incarnation of Red Hood wears black leather like his comic book counterpart. He wields two huge handguns. His face is obscured by a literal red hood. There's a red Batman emblem emblazoned on his chest. The Red Hood Story Pack is an exclusive pre-order bonus offered by GameStop. The retailer's advertisement doesn't mention any other details on this content, though. It's one of two bonuses that GameStop is giving out. The other is the Harley Quinn Story Pack, which lets players become Joker's main squeeze and use her unique abilities and equipment. Batman: Arkham Knight, the finale to the Arkham series, will be launching next year on PS4, Xbox One and PC. You can find out everything we know about the game so far by checking out our comprehensive guide.